A recent Instagram post from Manière Noire noted that there were few of these “Wake up the Dead” enamel pins remaining. Since these won’t be restocked, I knew it was time to get them featured before they’re all gone. Wake up the Dead is a black and white, soft enamel 1.5″ pin. Available currently for $15.00 CAD (Close to $12.00 USD) from the Manière Noire Shop. 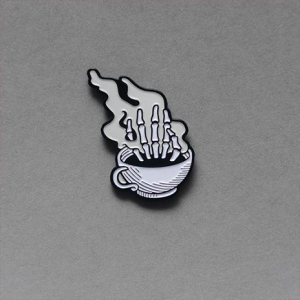 As much as we all like skeleton themed pins, coffee and great illustrations, this pin is too good to pass up.